Between 1830 and 1974, some 7 million people immigrated, mostly to North America, from Bremerhaven. Bremen, the smallest of Germany’s 16 states, is comprised of both Bremen and Bremerhaven. In 2005, Bremerhaven transformed its old docks from industrial service to a center of tourism and added The Immigration Museum, the first such museum in Europe. Some years later it added an Emigration wing to explore the flow of people into Germany. 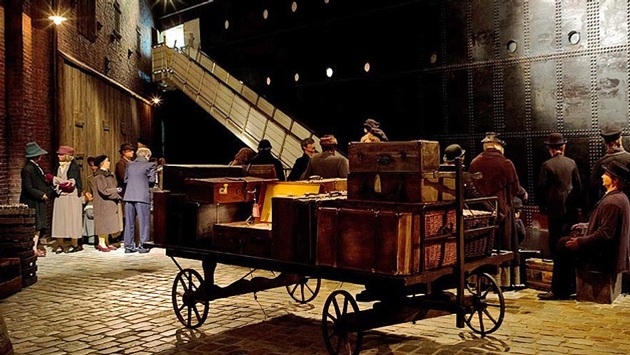 The museum, which won European Museum of the Year in 2007, manages to create an intimate portrayal of the entire experience by creating interactive installations that prevent visitors from regarding the entire flow of human migration as a mass exodus, but rather an assemblage of personal and individual experience. The museum encourages visitors to get inside different stories of individual immigrant emigrants as they embark on the journey. German Americans comprise almost 15 percent of the U.S. population, making them the largest ethnic group in the United States. Beginning on the docks of Bremerhaven, which literally creak under your feet, the journey recreates the passage, which was a six-to-12-week ordeal in the age of sail, an eight-to-15-day ordeal in the age of steam, and six-to-eight-day experience on ocean liners. The museum moves through those galleries and arrives in New York with recreations of Ellis Island and Grand Central Station that don’t recreate the spatial realities of those places, but uncannily does recreate the way they feel. Next door to the Immigration Museum is the Klimahaus or Climate House, another magnificent museum dedicated to climate. In this museum, you follow a path literally circumnavigating the globe along the longitudinal line of 8° East, which is Bremerhaven’s longitude. In the museum you literally walk along that meridian around the globe passing through all those climates, those cultures and those places on a journey that goes from 21° in the Arctic (admittedly a nice day there) to 86° in Samoa. Along the way you get to yodel in the Swiss Alps, cross rain forest streams, laugh with African children and so much more in an experience that literally leaves you feeling that you have just walked around the world. The town of Bremen itself is highlighted by its 600-year-old UNESCO-listed City Hall and the surrounding medieval neighborhood. Bremen was blessed by a lack of nobility and a church whose political powers were checked by wealthy sea traders. The Town Hall’s very building was meant as a check on the nearby cathedral. The burghers created a building that outstrips the cathedral and it’s still a great place to explore with its ship models hanging from the rafters and its great wood carvings. Beneath the Town Hall is a wine cellar that serves all German wines from each of 13 regions by the glass.